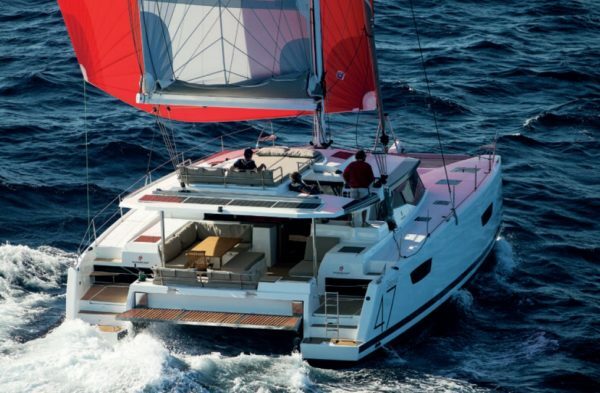 Catamaran sales surge, particularly, sailing catamarans, have overtaken power catamaran sales in the yachting industry. We have some experts weigh in on the subject. Lagoon is an acknowledged maestro of the sailing cat. 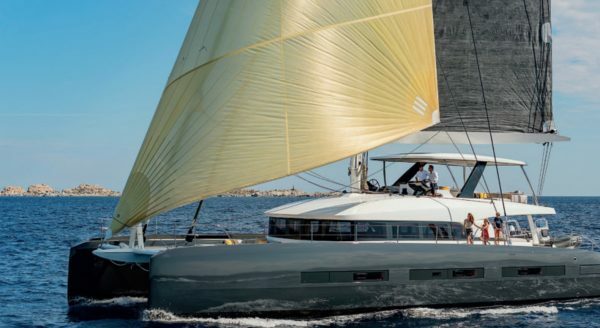 Central to the surge that saw France quickly become the world’s #1 exponent of multihull sailing, the yard launched its first vessel 35 years ago, and it currently has 11 sailing cat models on offer. 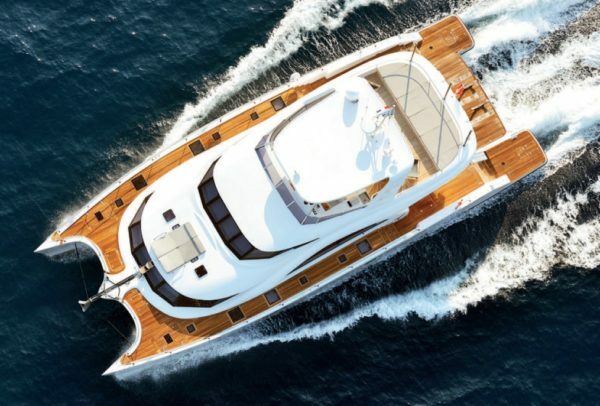 But recently it unveiled its first power cat, the Lagoon 630 MY, followed by the Lagoon sailing catamarans – SEVENTY 7 and Lagoon SEVENTY 8, reviewed in YACHT STYLE’s last two issues. One is a sailing cat, the other a power cat. This in itself recognises that after decades of nothing but sailing cats, there has been a distinct market shift toward power cats, by no means eclipsing the sailors, but still a significant trend. A Lagoon spokeslady points out that obviously sailing cats can be used as highly economic long distance cruisers, and this has underpinned their undoubted popularity. Using mostly wind power, they are environmentally friendly as well, and thus tick two prime boxes that appeal to modern boaters. Although they require a real passion for sailing, there are plenty of such people around: the need for more sailing abilities and sea knowledge to get out on the water is offset when the possibly noisier and vibrating engine is turned off. Those aboard become “at one” with the wind, which is an age-old argument between sailing or power monohull owners as well. Swish swish, and the scend of the sea. It can induce an almost transcendental state. Lagoon has found that families are interested in both options, but business types edge toward power cats. These latter models are associated with a little more luxury and comfort, and they don’t require raising and tending the sails. Power cats are less dependent on the prevailing weather, to an extent, but still, in Lagoon’s case, this is a much smaller market. Sailing cats continue to rule the roost. Sunreef, the large Polish builder that has extended its model range into the realms of multihull superyachts, has a similar story to Lagoon. 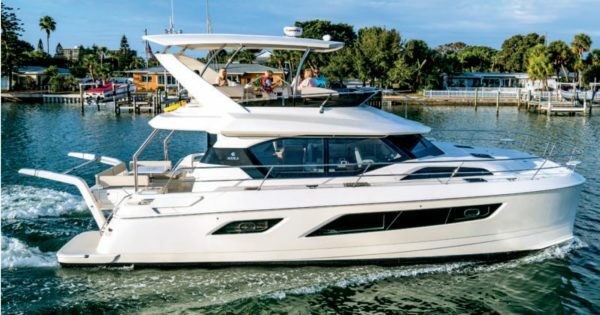 They now offer Sunreef 60-70-80 power cat models, but the rest are sailing cats. 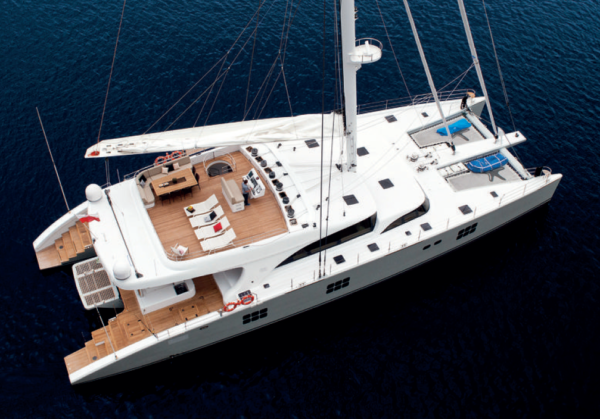 These immaculate vessels are also selling Asia-wide and can be found in most ports, reflecting the recent rise of multihulls in either category. If unable to see models locally, the next big boat show at which latest offerings will appear is the Cannes Yachting Festival 11-16 September. Chinese-built Aquila cats are somewhat different to the big brands in that they set out to be power cats in the first place, which Asia-based Commercial Director Yvan Eymieu says is a strong advantage. “We didn’t try to convert a sailing cat into a power cat”, he remarks. “Our initial 36, 44 and 48 foot Aquilas were designed as power cats from the outset, and they combine important elements like quality, comfort, reliability and balanced performance. “The Aquila 36 and latest 30 are probably the biggest breakthroughs by creating a product that is not offered by any other brand in the world today”. Aquila President Lex Raas started Leopard cats in 1995, and sold them into charter fleets as CEO of The Moorings and Sunsail, before moving on to the production of Aquilas at Sino Eagle in Hangzhou near Shanghai. Leopard has since completed Hull #100 of their highly popular Leopard 51 Power Cat, and Asian Sales Manager Kit Chotihamaporn says 11 have already been delivered to Southeast Asian owners. They are built at Robertson and Caine, designed by Simonis Voogd, stability begins the keynote and excellent fuel efficiency. One very experienced executive who has studied the sail versus power cat market in some depth is Mark Elkington, Managing Director of Asia and Australia-based Multihull Solutions. He has long been associated with Fountaine Pajot, but has branched out to include other brands in his portfolio, and is introducing the Iliad range of carefully controlled China-built power cats next year. “Many of our power cat buyers are coming from our sailing cat clientele”, he says. “They are getting to that age where a glass of red and a key to turn beats tugging on ropes and sheets to get to a destination. That said, the sailing cat market is still growing enormously. “Choosing a production multihull of any kind to suit your boating lifestyle can be a difficult process. It is a series of compromises, and accepting some design and layout areas in the boat that may not be ideal, as long as the most important features for your boating project and lifestyle afloat are all there. Then there is sail versus power. “I regularly see buyers purchasing a multihull that is so far from their initial project brief, tempted by a quick delivery, a cheap price or a deal offered by the supplier, an engine brand, or even a stairway they like to the flybridge. But they sacrifice all the things that they said were important at the start of their buying process. “For example, I had a buyer late last year who wanted a hull specifically designed for a power catamaran, not a sailing catamaran hull converted or a hull with little R&D. “The boat had to be proven off-shore, a comfortable dry boat at 15-17 knots in an average seaway, long range, positive floatation, and have the ability to carry reasonable loads for extended passages, both coastal and island hopping. “He ended up being persuaded by a supplier to purchase a sailing catamaran that had none of the features important to him in the initial consultation with us. The enjoyment of taking delivery of this ‘great deal’ will quickly pass as he comes to the realization that he has taken all the wrong compromises. “So, what are the lifestyle and feature differences between a well-designed sailing and power multihull? Firstly, they both offer many of the same benefits. “Stability at anchor and underway without costly stabilisers, very large interior and exterior living areas compared to similar size monohulls, exceptional privacy for the owner, as sleeping accommodation are separated in a dedicated hull, good fuel economy, shallow draft, and well-above-average re-sale values. “It then comes down to how you enjoy boating, to make the decision between sail and power. We all approach boating with lifestyle in mind and your boating background will play a big role in your choice. But as I said earlier, the right choice stems from a list of compromises that you cannot live without. “Power multihull buyers generally don’t want to deal with the sails and all the activity that goes with raising, reefing, trimming etc, and they usually want to travel between locations at a speed that a sailing catamaran won’t achieve. “They are generally more experienced boaters who have had a number of previous boats and know what they want in a new design, although I’ve also seen some interesting one-offs that are almost impossible to re-sell. “We see many power cat clients who have owned sailing mono and multihull boats. The swing to power appears to be for the same reasons, like not being as agile as they were in their younger years to handle the sails and all the activity that goes with the sport. “They feel safer not having to be on deck to manage changing weather conditions when under sail, and generally prefer just a turn of a key from a protected all-weather helm station. 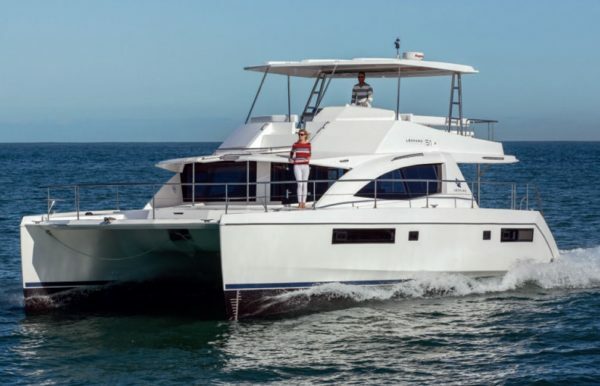 “Some simply want to travel to their favourite anchorages and waste less time getting there, and a few say they have a bridge height issue to navigate after relocating to a new home, so the power catamaran “air height” allows less tidal-affected passages. “Sailing multihull buyers are generally sailors by nature and enjoy the quiet lifestyle afloat that sailing offers while underway. They also enjoy the activity of sailing and the challenges that the sport offers. “For those who have experienced sailing a well-designed sailing cat on a broad reach passage-making, with the wind blowing at around 90 degrees to either side of the boats heading, this can provide some of one’s most memorable days on the water. “And the wind if free like this, there is very little fuel cost apart from running an engine or generator occasionally to charge batteries. A standard production sailing catamaran is very capable of sailing around the world using wind power, whereas a power catamaran of 50 feet LOA, for example, will not carry the fuel required to make such long isolated ocean passages. “Sailing does, however, come with its own list of compromises. You cannot sail directly into the wind, and at times you have no choice if you need to get to an anchorage and the wind turns against you. “The choice is to drop the sails and motor, or tack – sail around 45 degrees either side of the wind direction – so a passage to windward can be slow-going at times, and uncomfortable if seas build above two meters. “Additionally, a well-designed cruising multihull will average around 7-8 knots in general trade wind conditions (12-18 knots). Some designs will travel faster, but it is often the sea and wind that will dictate your speed, not the performance of your sailing multihull. “In summary, I have seen the biggest swing to multihull designs over the past few years, after a 20+ year history of working within the boating industry. “The reasons are logical, and it is very rewarding to see our companies with forward multihull orders exceeding 40 new builds, in comparison to this time three years ago. “And while these multihull boats may not have as great looks of some of our sexier monohull cousins, the leading multihull shipyards and designers are closing the gap and improving all the time. “Power or sail? It is all about the distance you wish to travel in isolation and what you want to achieve from life afloat. Both offer that the other cannot. In a perfect world, I would have one of each, and a really nice sailing dinghy hanging off the davits”. There are other aspects which space dictates will have to wait for a future issue, such as long-time sailing cat aficionado Anton Marden recently switching to a power superyacht trimaran called Adastra, built by McConaghy in Zhuhai, and recently in the Caribbean via the Pacific under her own power. And Karl Kwok, now in his 70s, turning up for the Rolex CSR in a MOD 70 trimaran. He explained: “I’ve been a monohull sailor since 1975, so really this has been a brand new experience. All I can say is that it’s not as comfortable as a monohull, but it’s super fast. We notched 37 knots. At that speed, you are like a motorboat with the same amount of shaking and rumbling. As I get older I guess this is the only way to save precious time racing. You can do offshores in less time”.